Nyaung Oo, Mandalay Division, Myanmar. Set within Bagan Archaeological Preservation Zone amongst the ancient temples of The Kingdom of Bagan this expansive resort and luxury spa set amidst 27 acres of tropical landscaped gardens offers the ultimate in relaxation for guests seeking a unique experience for the historical traveler. Antiques, artifacts and local arts uniquely adorn each property, complementing the majestic ambiance of the resort and surrounds. Strolling through the grounds enjoying the breezes rolling off the lake refreshes the palate from the heat and dryness of ancient Bagan. Bedrooms are spacious and elegant with all modern facilities: bathrooms are large and lavishly equipped with luxurious amenities. Indoor or al-fresco dining options and bars, cultural entertainment or rest by the poolside for ultimate repose. The Hotel @ Tharabar Gate is located in the most unique Archeological Site of South East Asia, the Ancient capital of the Burmese Empire, Old Bagan. Surrounded by more than 4000 ancient temples and Pagodas, you will be enchanted by the breathtaking views. The Hotel @ Tharabar Gate is within 5 minutes walking distance to the spectacular Ananda Temple known as ‘The Jewel of Bagan’. The Hotel offers 83 luxury rooms including 4 Suites. Every room is decorated with teak floors and typical Burmese furniture. All rooms are fully air-conditioned and feature an IDD Telephone line, Sat- Television, Safety Deposit Box, Mini Bar and a private Garden. Each room with its high ceiling and different hand painted wall painting which are all copies of original Temple Painting of the Bagan period. Internet and Wi-Fi is available in the Lobby. The Hotel offers 2 dining choices, one in the Tropical Garden and as an alternative the semi-open Main Restaurant. The Restaurant accommodates 100 Diners and 150 around the Swimming pool and garden. The restaurant is well known for its open air fine dining, traditional Myanmar food, Europeans and Asian Cuisine. The hotel also features a pool side bar to relax with a cool Cocktail or Drinks of your choice. Furthermore the Hotel offers the option to order In Room Dining 24 hours. For Relaxation after a day of Sightseeing we invite you to experience our Spa with Signature Treatments of Myanmar and Thailand. The 24 hours Butler service will arrange for you Transport, Guides, Sightseeing Tours, Airline Reservations, or book a Balloon Ride with our Partner:" Balloons Over Bagan". The hotel is 15 minutes drive from the Nyaung Oo Airport and most major sightseeing places that Bagan is known for. We can offer Sunset Boat trip with Snacks and Drinks on board to watch the beautiful Sunset over the Ayeyarwaddy as well as Excursions to Mount Popa (Taung Kalat). Whatever you like to do during your time in Bagan, we are here to make your visit an unforgettable one.. The Aye Yar River View Resort offers a range of accommodation designed to suit the demands of the individual traveller, honeymooners , family , or for a corporate events. 103 spacious rooms of deluxe category or better. All with private patio or balcony and with panoramic views of the Ayeyarwaddy River or ancient pagodas or gardens All rooms and suites offer a mix of old Bagan – inspired and contemporary designs with indigenous handmade furnishings. The private patio or balcony offers the opportunity to dine or simply relax. The Aye Yar River View Resort offers a range of accommodation designed to suit the demands of the individual traveller, honeymooners , family , or for a corporate events. 103 spacious rooms of deluxe category or better. All with private patio or balcony and with panoramic views of the Ayeyarwaddy River or ancient pagodas or gardens All rooms and suites offer a mix of old Bagan – inspired and contemporary designs with indigenous handmade furnishings. The private patio or balcony offers the opportunity to dine or simply relax..
Add: No. 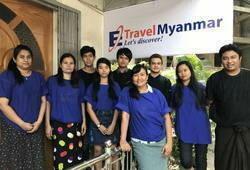 361, Pyi Thar Yar Street, Thingangyun Township, Yangon, Myanmar. Bagan Thande Hotel is located at the south-west corner of the ancient walls of Old Bagan City and on the eastern bank of the River Ayeyarwaddy and also situated inside Bagan Archaeological Zone. Bagan Archaeological Museum is in the east side of the hotel and the west side is the superb Ayeyarwaddy River. It is 6.4km far from Nyaung Oo, 4km from New Bagan, 10km form airport, 16km form railway station and 1.5km form jetty. Several well-known Buddhist Monuments are within walking distances from our hotel. The following special benefits are provided for staying with us during your stay at Bagan Thande Hotel. 15% discount on Food & Beverages purchases at the hotel. Enjoy one set meal (lunch or dinner) for minimum 2 nights stay. ONE day free E-bike (which is worth MMK 15,000). Minimum 3 nights stay required and applicable for July 2016 to Feb 2017. HALF day free E-bike at morning time (which is worth MMK 7,500). Minimum 2 nights stay required and applicable for July 2016 to Feb 2017. Please reserve your complimentary E-bike claim date upon arrival at our reception counter. You are welcome to share ONE E-bike between TWO persons. All term and condition are Subject to availability. We will try our best to your satisfaction.. Address : No.22, Thazin Road, Archaeological, Province, Bagan, Myanmar. Thazin Garden Hotel,Bagan is a Grand stadium located on the high plain surrounded with ancient pagodas and ruins. Due to the elevated position the viewers can enjoy the natural scenes of hilly ridges and greeny plains, especially the golden Pagodas.The ideal gift for the visitors is for peace of soul and body.Thazin garden Hotel consists of 50 Garden View Deluxe rooms and 17 Pagoda View Deluxe rooms. Architecture - Myanmar – traditional design – Mainly of teak components, the roofings are double decked of teak shingles. Garden Area - Spacious Garden Area – attractively paved with brick apron, whitish curving around the front space of sidewalks, pathways crossing and winding across the garden area and the private lanes to the bungalows are wisely planned. Tall dainty coconut trees are charming addition to the area of colourful flowers dancing with the breeze. Add: Bagan, Myanmar, Mandalay Division. 42 Deluxe are over looking the swimming pool, all provide the amenities of Bagan Lacquer-ware and comforts one expects room of a luxury resort. You may discover a romantic setting where Ancient Bagan sensuous luxury and seclusion are ingeniously combined. 20 Suite Bungalows and 4 Corner Suites at the Amazing Bagan Resort are designed in the traditional styles of ancient Burmese architecture and are built to international standards. This beautiful Amazing Suite echoes the tranquility of Amazing Bagan Resort.Room is decorated in luxurious Ancient Bagan Style with stunning offers,Spacious cozy bed room,bathroom with rain shower and modern amenity,a separate living room and private bar,wooden terrace to the tropical garden vie and many more well-appointed amenities & facility,that you ever expected from high-grade property. Conveniently located in Bagan, Bawga Theiddhi Hotel is a great base from which to explore this vibrant city. From here, guests can enjoy easy access to all that the lively city has to offer. For those of you who want to venture out, Eight Faces Paya, Archaeological Museum, Ananda Pahto are just some of the attractions available to visitors. At Bawga Theiddhi Hotel, the excellent service and superior facilities make for an unforgettable stay. This hotel offers numerous on-site facilities to satisfy even the most discerning guest. Step into one of 50 inviting rooms and escape the stresses of the day with a wide range of amenities such as coffee/tea maker, hair dryer, complimentary bottled water, television LCD/plasma screen, DVD/CD player. The complete list of recreational facilities is available at the hotel, including outdoor pool, garden, massage, jacuzzi, spa. With an ideal location and facilities to match, Bawga Theiddhi Hotel hits the spot in many ways..
Add: 5th Thiripyitsayar Street, Nyaung U, Mandalay Region, Myanmar. Last decade ago, the area of Zfreeti Hotel was standing as two separate hotels named ‘New Heaven’ and ‘Golden Village’ Hotel. These two hotels were popular as low budget hotels for many years. In 2012, those old styled bungalows were demolished and the contemporary two stroyed buildings were developed which is mixed with ancient Bagan architectural design. Newly built Zfreeti Hotel includes 4 suite rooms, 42 deluxe, 10 Superior rooms and 46 standard rooms where approximately 200++ visiting guests can accommodate altogether at the same time..
Set in the heart of the town, our hotel is built on 4 acres of land, with 11 bungalows of 39 rooms. We are a family owned business catering to the mid-range budget travellers. The rooms are set in a 4 room bungalows, or 3 room bungalows. The swimming pool is set in the middle of the garden, with the lawn to sit and relax the hot summer days away. We are close to all amenities; transport, attraction sites, and restaurants. Enjoy your days sightseeing, exploring the town and lifestyle of the locals. Soak yourself in the pool after a long day and let our staff deliver you the meal to enjoy by your poolside. We have a restaurant with Asian and European dishes and a bakery. We have 39 rooms of 11 superior bungalows in total. Each rooms are furnished with parquet floors, and spacious bathrooms as well as the wide porch (verandah) at the entrance to your room. All rooms are equipped with Air- Condition, Mini-bar, Satellite television, IDD calls, hot-cold shower and bathtub..
Every time you open the curtains from your room, you can see the panorama view of ancient Bagan temples. Located at the edge of archeological monument zone, surrounded by farms and ruins of temples, Kumudara Hotel is the only hotel in Bagan with the unbeatable location where you can enjoy the priceless view of hundreds of pagodas and at least 10 famous ones. Famous pagodas include Su La Ma Ni Pahto, Dhamma Yan Gyi Pahto, Ananada Temple, Shwe San Daw Paya, and That Byin Nyu Temple. Situated in the middle of 4 acres of beautifully landscaped gardens and 12.9 acres of farmland, the atmosphere is very quiet, peaceful and serene. If you are looking for a place to escape from your daily stress at the best location in Bagan, Kumudara Hotel is the right choice for you. This is where your Bagan dream comes true!. Renovated in 2013, the Raza Gyo Hotel guarantees guests a pleasant stay whether in Bagan for business or pleasure. The excitement of the city center is only 1.5 Miles away. For those of you who want to venture out, Eight Faces Paya, Archaeological Museum, Ananda Pahto are just some of the attractions available to visitors. At Raza Gyo Hotel, the excellent service and superior facilities make for an unforgettable stay. Located at the New Bagan and on the way to Nyaung Oo airport within 7 minutes. And also 10 minutes drive to Old Bagan, serveral ancient pagodas in archaeological site.